Speed 40 ft., burrow 30 ft., fly 80 ft., swim 40 ft.
Ice Walk. The dragon can move across and climb icy surfaces without needing to make an ability check. Additionally, difficult terrain composed of ice or snow doesn't cost it extra movement. Bite. Melee Weapon Attack: +11 to hit, reach 10 ft., one target. Hit: 17 (2d10 + 6) piercing damage plus 4 (1d8) cold damage. Frightful Presence. Each creature of the dragon's choice that is within 120 feet of the dragon and aware of it must succeed on a DC 14 Wisdom saving throw or become frightened for 1 minute. A creature can repeat the saving throw at the end of each of its turns, ending the effect on itself on a success. If a creature's saving throw is successful or the effect ends for it, the creature is immune to the dragon's Frightful Presence for the next 24 hours. Cold Breath (Recharge 5–6). The dragon exhales an icy blast in a 60-foot cone. Each creature in that area must make a DC 19 Constitution saving throw, taking 54 (12d8) cold damage on a failed save, or half as much damage on a successful one. White dragons lair in icy caves and deep subterranean chambers far from the sun. They favor high mountain vales accessible only by flying, caverns in cliff faces, and labyrinthine ice caves in glaciers. White dragons love vertical heights in their caverns, flying up to the ceiling to latch on like bats or slithering down icy crevasses. A legendary white dragon’s innate magic deepens the cold in the area around its lair. Mountain caverns are fast frozen by the white dragon’s presence. A white dragon can often detect intruders by the way the keening wind in its lair changes tone. A white dragon rests on high ice shelves and cliffs in its lair, the floor around it a treacherous morass of broken ice and stone, hidden pits, and slippery slopes. As foes struggle to move toward it, the dragon flies from perch to perch and destroys them with its freezing breath. Freezing fog fills a 20-foot-radius sphere centered on a point the dragon can see within 120 feet of it. The fog spreads around corners, and its area is heavily obscured. Each creature in the fog when it appears must make a DC 10 Constitution saving throw, taking 10 (3d6) cold damage on a failed save, or half as much damage on a successful one. A creature that ends its turn in the fog takes 10 (3d6) cold damage. A wind of at least 20 miles per hour disperses the fog. The fog otherwise lasts until the dragon uses this lair action again or until the dragon dies. Jagged ice shards fall from the ceiling, striking up to three creatures underneath that the dragon can see within 120 feet of it. The dragon makes one ranged attack roll (+7 to hit) against each target. On a hit, the target takes 10 (3d6) piercing damage. The dragon creates an opaque wall of ice on a solid surface it can see within 120 feet of it. The wall can be up to 30 feet long, 30 feet high, and 1 foot thick. When the wall appears, each creature within its area is pushed 5 feet out of the wall’s space, appearing on whichever side of the wall it wants. Each 10-foot section of the wall has AC 5, 30 hit points, vulnerability to fire damage, and immunity to acid, cold, necrotic, poison, and psychic damage. The wall disappears when the dragon uses this lair action again or when the dragon dies. Chilly fog lightly obscures the land within 6 miles of the dragon’s lair. Freezing precipitation falls within 6 miles of the dragon’s lair, sometimes forming blizzard conditions when the dragon is at rest. Icy walls block off areas in the dragon’s lair. Each wall is 6 inches thick, and a 10-foot section has AC 5, 15 hit points, vulnerability to fire damage, and immunity to acid, cold, necrotic, poison, and psychic damage. If the dragon wishes to move through a wall, it can do so without slowing down. The portion of the wall the dragon moves through is destroyed, however. If the dragon dies, the fog and precipitation fade within 1 day. The ice walls melt over the course of 1d10 days. Nice. Was it challenging? I'm planning to set this up as a challenge for my campaign, and after i spend a whole campaign building up to this, I hope it is a challenging and rewarding foe! 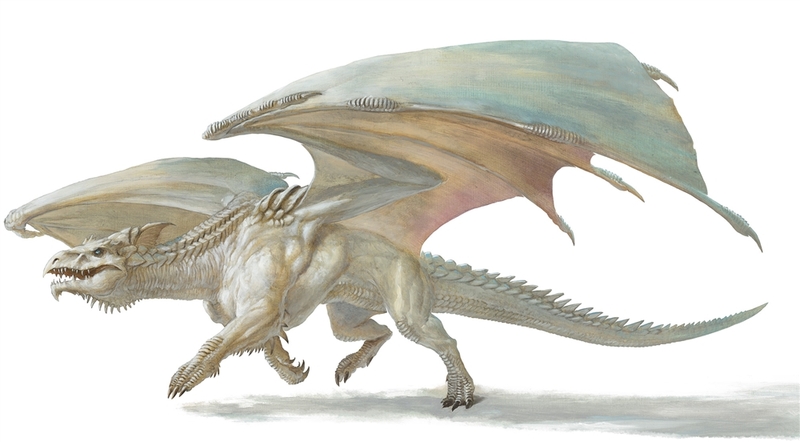 Only in dnd logic are the pretty white dragons evil. I'm glad this is in Hoard of the Dragon Queen, because I'm setting up to play it and I really want to engineer a battle on this guy! Painted a primarily white dragon, with half breed blue secondary. Trying to build a character sheet for this. With the white attributes as the stronger gene. Any ideas? Adult 14CR.